The brand new Arai MX-V motocross helmet has evolved from the much loved Arai VX-3 model. Years of experience can be found in this ultimate off-road helmet. The perfect choice for MX, enduro and off-road use. Just as found in every Arai helmet, the basic and simple organic shell shape is based on the R75 Shape concept. The absence of exaggerated edges or protrusions on the shell is not a lack of creativity, but a commitment to maintaining the integrity of the shell with real world impact performance. Completely designed from scratch, with all the experience and know-how gained in decades of title-winning racing. 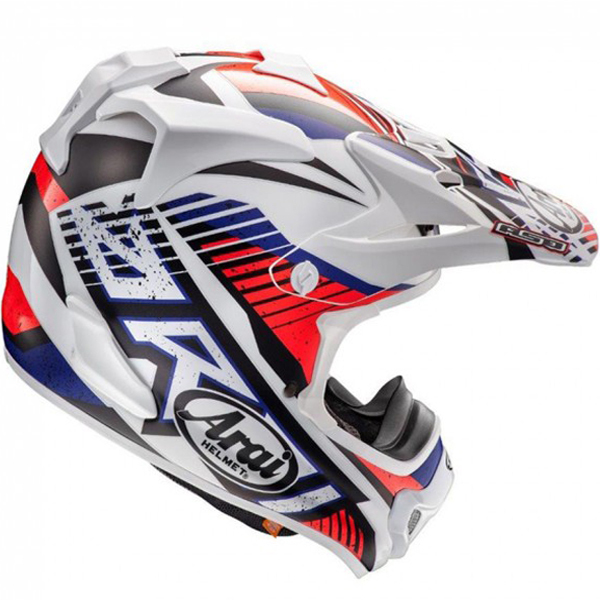 That is what makes the brand new Arai MX-V off road/motocross helmet such an outstanding new entry in this highly competitive helmet segment. 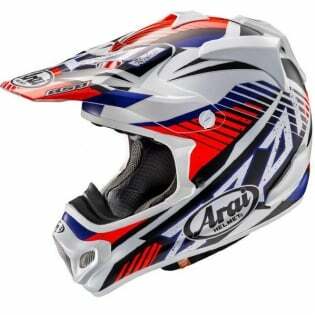 Next to the comfort and fit every Arai MX-V helmet is famous for, the new Arai MX-V offers and advanced peak design. For every off-road rider, the peak is of great importance. It does not only protect against mud and flying stones, it also prevents sunshine glare. At the same time, the peak increases ventilation efficiency and decreases wind pressure. 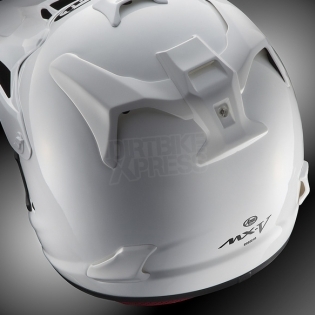 The Arai MX-V peak effortlessly performs all these tasks while looking good at the same time! The new side trim at the edges of the aperture shows the experience of Arai MX-V. They allow the goggle strap to stay firmly in position, even during extreme motocross riding. This attention to detail can also be found in the new mouth vent. Which can be easily removed for cleaning and incorporates a (stainless steel) mesh that not only keeps dirt out but also improves penetration resistance. A very effective ventilation is critical for an off-road/motocross helmet. That is why Arai MX-V redesigned the ventilation system: the easy to clean diffusers, centre top vent and dual intake create an increased airflow. The under-peak air intake collects and directs cool air into the helmets crown area. The inner chin vent shutter controls the airflow to the chin area and prevents debris coming into the helmet in dusty riding conditions. The removable three-piece rear exhaust creates a tremendous amount of venturi vacuum at the rear. They can be easily removed for cleaning or replacement. The side vent exhausts produce low pressure behind the rear vent for better hot air extraction. As they are integrated into the small for better aerodynamics, they also reduce wind noise and prevent buffeting at higher speeds. Inside, a small foam dam helps to absorb and diminish excessive noise, without reducing ventilation performance. Dry-Cool® liner - An important feature for all off-road riders is the completely removable and washable Dry-Cool® interior liner. All parts (interior lining, cheek pads, neck roll and even the chin strap covers) can easily be taken out for cleaning, assuring a fresh interior for every event. Developed for and tested in MotoGP it uses micro water cells to improve moisture and heat transfer from the head to the airflow and dries much faster than conventional textiles to help keep your head cooler and dryer during a long ride. As always, form follows function with Arai. There are many superficial items you can add to a helmet: items that may look good, but add nothing to the function of the helmet. 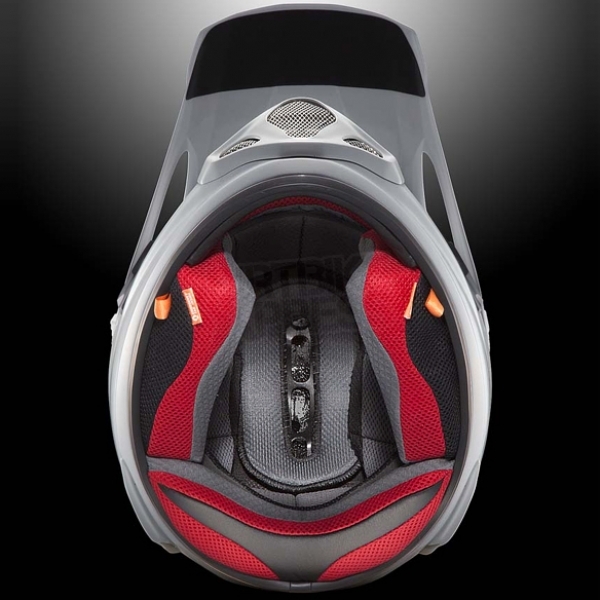 In this regard, Arai produces functional helmets with functional innovations. Then, maybe we'll look at the visuals. Being riders, we know how important comfort, fit, ventilation and confidence are. And we think most of us here at Arai are pretty typical riders. CLC (Complex Laminate Construction) shell fibreglass composite is stronger and lighter allows the use of softer, less-dense liner materials inside for increased rider comfort. More efficient chinbar centre vent shape. Large chin bar side exhaust vents.